Albert Einstein was a German-born theoretical physicist who developed the theory of relativity, one of the two pillarts of modern physics. He was also a big influence in the philosophy of science and lived from 1879 to 1955. 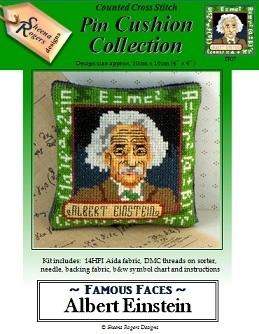 His most famous equation, E = mc² (which foreshadowed the development of atomic power and the atomic bomb) is included in the border of the design. This pincushion cross stitch kit includes: 14HPI white aida fabric, ready-sorted DMC stranded cotton threads on a card sorter, needle, backing fabric, b&w symbol chart and instructions. THIS KIT ALSO INCLUDES A BAG OF FILLER FOR COMPLETING YOUR PINCUSHION. Design size: 4" (10.2cm) square. Only whole cross stitch with some backstitch is required.